Ricky Gervais was born on June 25, 1961 in Reading, Berkshire, England. He received an Upper Second-Class Honors degree in philosophy at the University College London. 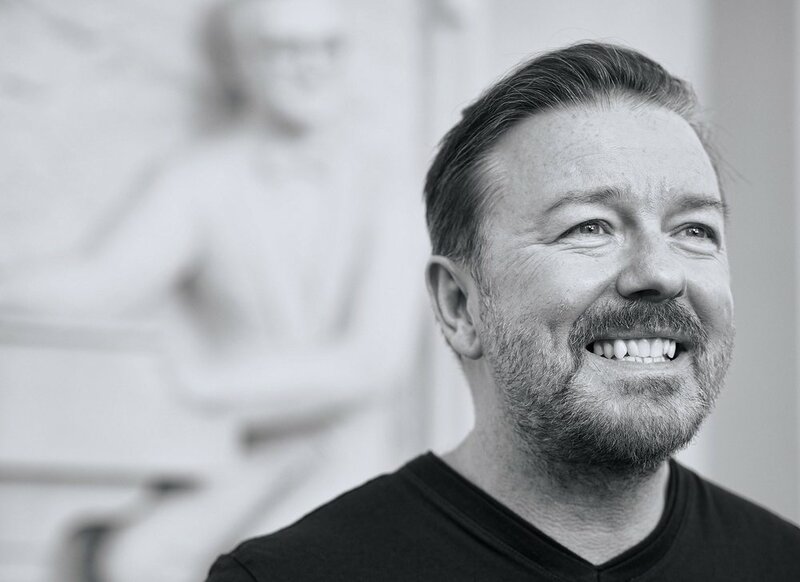 Gervais initially attended the University to major in Biology, but switched to Philosophy after two weeks. Before his start in comedy, he pursued a career as a pop singer. He was even signed to a London record label and in 1983 released a song that became a hit in the Philippines. Gervais started comedy in the late 90s and made multiple appearances on the Channel 4’s, “11 o’clock Show”, around that same time. By 2000, he got his own show on the channel called, “Meet Ricky Gervais”. A year later, he released the BBC series, “The Office”, which he wrote, directed, and starred in. In 2003, he toured with the release of his first stand up special, “Animals”. There are very few things that Gervais has not accomplished. He had done radio, podcasts, released music, written children’s books, written, directed, and starred in the TV series’ as well as movies. And on top of all that, he has released many standup specials with the most recent one, “Humanity”, releasing earlier 2018 on Netflix. This week, Kaizen Komedy looks at the work of Ricky Gervais. With Gervais nothing is off-limits. He tackles a wide range of topics from social taboos to generally sensitive subjects. His contrarian views get the crowd’s attention, as he makes his case on the topic at hand. Gervais has a way of keeping the audience laughing, all the while reiterating the power, importance, and the necessity of jokes.